Sefiani launched REST Industry Super’s latest body of research, Making a Break, revealing how a lack of financial planning for career breaks is costing Australian women almost $160,000 in lost super. To bring this important story to light, Sefiani secured a first run with News Corp, which syndicated across all online news sites, alongside a live-to-air interview with ABC News 24, coverage on Channel Ten evening news, and four talkback radio interviews nationally. Research released today by REST Industry Super, one of Australia’s largest superannuation funds with around 2 million members, has revealed that women are taking a $159,590 hit to their retirement savings due to taking career breaks, which can be potentially worsened by not making a financial plan when it comes to their super ahead of planned career breaks. According to Making a Break, new research commissioned by REST to examine the financial impacts of career breaks on working Australians, just 6 per cent of women participating in the survey sought professional financial advice before taking their career break and less than one in five (16%) women made a superannuation contribution during their break. Due to this, and lower average earnings, women who have taken a career break are predicted to retire with an average superannuation balance of $283,141 less than their male counterparts. The research found that two-thirds of working Australians have taken at least one career break at some stage in their working lives, with an average of 3.5 career breaks overall. Health breaks are the most common type of career break taken by Australians, particularly for men, who typically took a health-related career break at 44 years old. 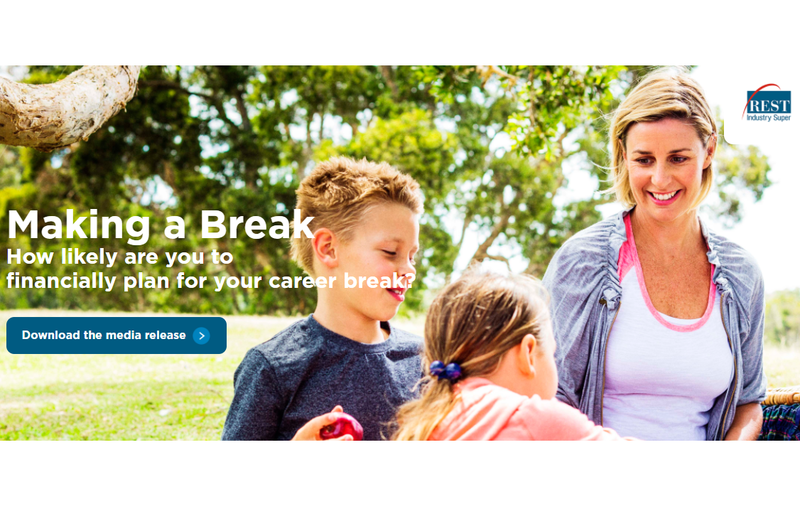 “When we think about career breaks, we typically think about parental leave or an extended holiday – it is interesting to see the large proportion of working Aussies forced to take breaks due to their health,” said Mary Atley, General Manager, Brand, Marketing and Communications. According to the research, the average age women take their career break is 33 years, with maternity leave (50 per cent) the primary reason, followed by leave to care for children (49 per cent), and health reasons (45 per cent). Interestingly, despite being most likely to take a planned break, women are 30 per cent less likely than their male counterparts to make any retirement income plans when it comes to their break, which may contribute to the $159,590 loss to their retirement balance. “Awareness, advice and commitment are the keys to ensuring a more financially stable future before, during and after a career break,” added Ms. Atley. “Our research has exposed that women in particular are feeling the burn when it comes to their superannuation shortfall. “There are a range of structural issues which contribute to the gender super imbalance, but our research shows that the lack of financial planning ahead of a career break is potentially one of the most important factors. Nearly $160,000 is a significant hit to a woman’s retirement income – a hit which can be lessened with some careful considerations and actions,” said Ms. Atley. Upon their return to work, lack of, or ineffective negotiations with employers could continue to contribute to the superannuation gap. Women returning to work after a career break tend to earn 29 per cent less than their male counterparts, an average difference of around $16,000 per year. In order to return to an income equal to before their career breaks, women had to work 11.8 months, a full month longer than men (10.7 months). “This highlights a range of contributing factors to the gender superannuation gap. We’re here to help women prepare for any career breaks – whether planned or unplanned and offer REST members straightforward advice about where to invest their super, how to maximise their super investment or assess their insurance needs at no extra charge,” said Ms. Atley. This is the economically modelled amount of lost superannuation balance of working women at the retirement age of 67 between those taking no career breaks and those taking career breaks, of which they took 4.2 career breaks on average. The calculations are based on self-reported cost per career break; 9.5% compulsory contribution to superannuation is assumed for the entire working life; 15% contribution tax; and superannuation account balance is compounded annually at 4.95% (based on average 10-year rate of return after tax and fees from APRA Annual Fund-level Superannuation Statistics 2016). No voluntary contributions are modelled. The results are on 2017 Australian dollars with no adjustment for inflation. This is the economically modelled average difference of superannuation balance by the retirement age of 67 between men and women if they took one career break. Career breaks taken that are over three months due to a health-related issue. This is the average difference of income between men and women after taking their career break.